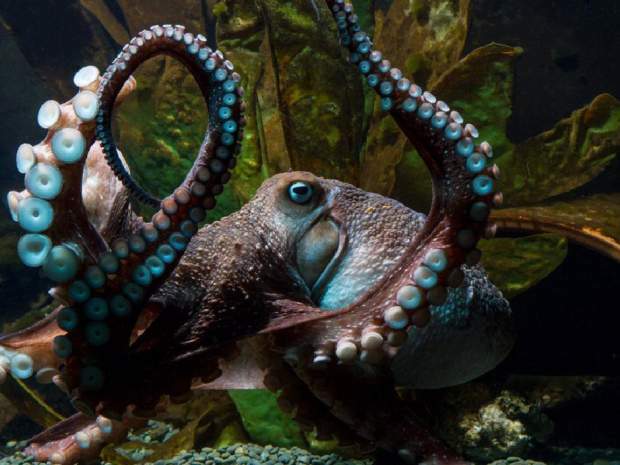 Inky the octopus, escaped from New Zealand’s National Aquarium and made his way to the ocean. Courtesy of The National Aquarium of New Zealand. Inky the octopus didn’t even try to cover his tracks. I loved this story so much I had to blog it. By the time the staff at New Zealand’s National Aquarium noticed that he was missing, telltale suction cup prints were the main clue to an easily solved mystery. Inky had slipped through a gap left by maintenance workers at the top of his enclosure and, as evidenced by the tracks, made his way across the floor to a 15-centimetre-wide drain. He squeezed his football-sized body in — octopuses are very malleable, aquarium manager Rob Yarrall told the New Zealand website Stuff — and made a break for the Pacific. Read more from Karen Brulliard in Washington Post. Oh my goodness! What a brave little guy 🙂 A great story for sure. Go, Inky, go! Live free. 🙂 Live free for sure. How are you Sue? Thank you for those re-tweets. I’m great, Joycelin. Just crazy busy as usual. Thanks for asking. I hope you’re doing well. That’s great. I’m doing well. Thank you. YEAY! 🙂 Thank you Jill. Wow! I’m impressed by his daring and smarts and I’m hoping he made it and gets along fine out in the wide world. She/he/it is my hero! 🙂 My view is that if it was that smart and got out, it is definitely a survivor. I’m glad you like the story too.